One of my favorite things about Spring and Summer is garden time! There’s nothing like digging in the dirt, watching veggies grow, and being able to go outside and pluck something fresh to eat! 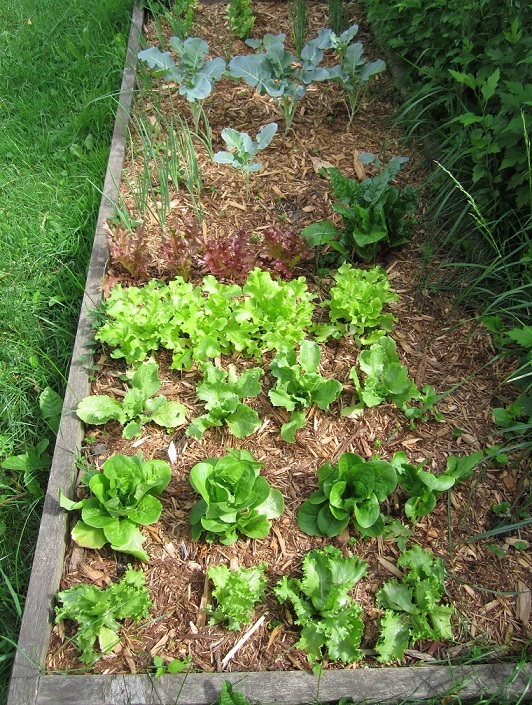 I have 2 raised bed veggie gardens at my house and my mom has several at the cottage. 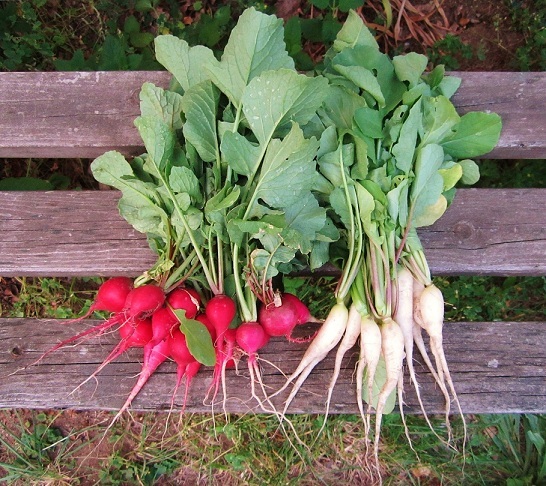 Delicious radishes from the cottage garden! This is about half of what I picked this past weekend! Mom's whiskey barrel planter. Great idea! The lettuce is looking lovely! She already cut it back once so this is the second round. Fantastic fresh salads are on the menu! She has a few others, one with spinach and herbs, and a few with blueberry bushes in them. One of the gardens at my house. 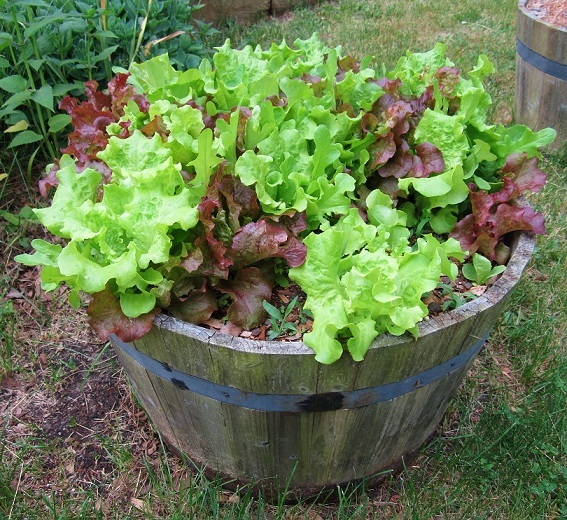 5 types of lettuce this year, swiss chard, onions, broccoli, leeks, and celery fill up this one. The smaller of the two beds. 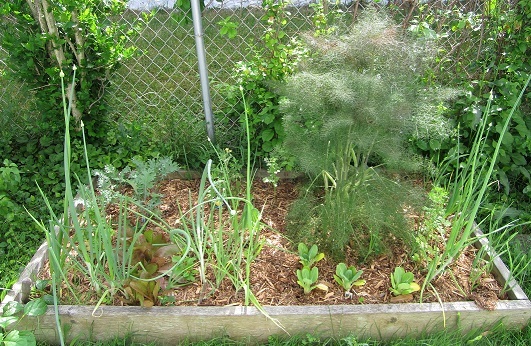 This one has onions, garlic, kale, the token tomato plant, pak choi, basil, and a huge fennel plant. I like to use fennel leaf in salad but if anybody has a great recipe for the leaves let me know! Well, I had the opportunity to get a larger space at Lost & Found here in GR so I decided to try it out. Besides the shelf space I have at this great shop this is the first time I’ve ever rented a larger booth space. 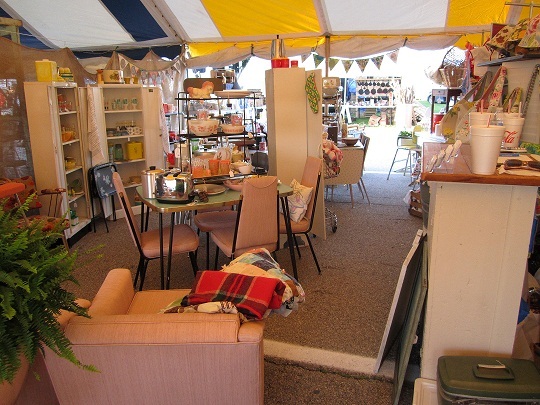 I love this shop because it’s not your typical antique mall with booths just crammed full of stuff. The store is more like styled rooms and seems like a good fit. You'll find me under the VintageGoodies banner! The booth is filled with great green goodies at the moment! 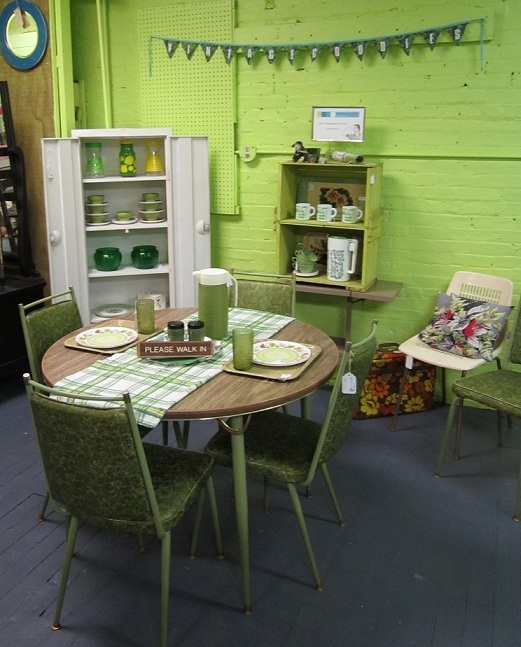 Including this table and 5 chair set, includes leaf, it's dated 1969. Besides great vintage housewares you'll find things like little handmade barkcloth pillows! So the truck thing was a little crazy, but our booth turned out pretty great! We got tons of compliments and lots of folks telling us our booth was their favorite which was such a nice thing to hear! One of them even said if she had a ribbon she’d give it to us! Thanks to all of our great customers at this show! Below are just a few pics of our booth. The front porch, one entrance to our space. It was pretty cool being under the big top and we were really lucky to have a nice cross breeze with the sun and heat at this show. Part of our office area. Inside the shop, I loved the look of the bigger pieces meshing with the smaller ones. But I have to be honest and say that after moving furniture all week I think I"ll stick with my one true love, housewares. The kitchen area continues and meshes into the garden area! And finally, the back porch, with laundry area to the left. Anatomy of a Show Part 3- Ode to Mr. Truck. Wow, what a week. Feels great to finally be back home! I thought I would have time to post pics during the show but I was too exhausted at the end of the day. 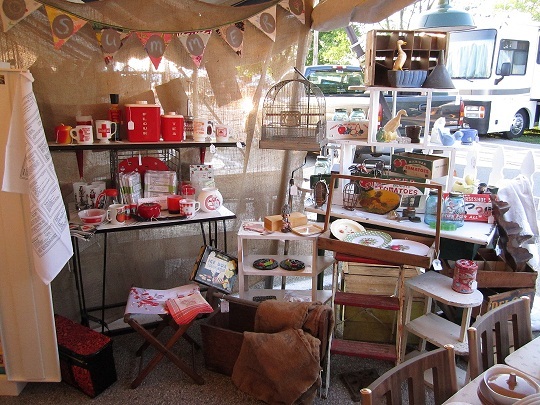 We set up Thurs which meant 9 hours of unloading the truck and merchandising our store on the road. Speaking of the truck, Mr. Truck was a little cranky on the trip. We went out to leave for opening day and it wouldn’t start. I called a cab, then a super duper nice couple from Chic Unique let us hitch a ride with them. Then we hitched a ride back to the hotel with Emma Lou Vintage who were gracious enough to offer us a ride back to the show in the morning. Then, Vintage Chic gave us a ride to our truck at the shop. We are so thankful to have been surrounded by super nice and helpful folks. We can’t thank them enough for helping us out! This is what our booth looked like at the end of setup day. 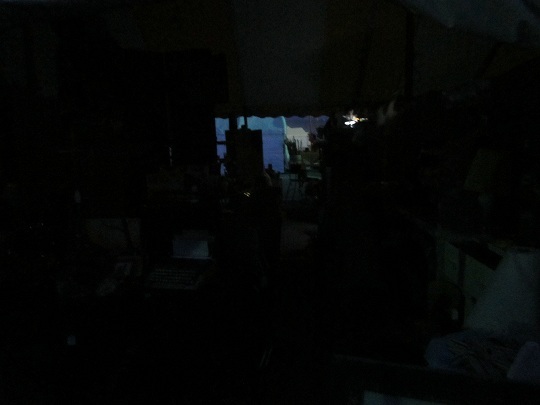 Still a bit of work to do but working by flashlight wasn't happening. Sleep needed here. 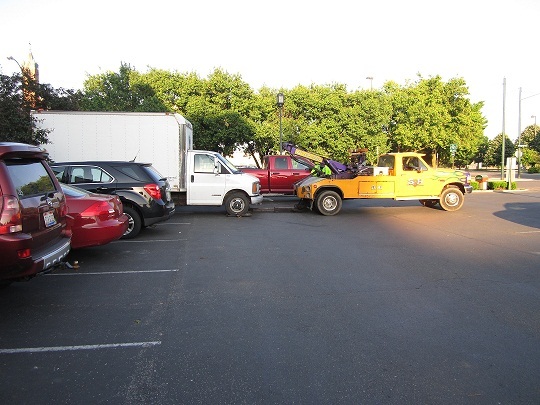 Friday night we got Mr. Truck towed to a nearby shop. Bummertown. The truck is fixed! Wait a minute, after dinner it stalled on us. Lisa B. mobile mechanic to the rescue here. These are the kind of gals I like to roll with. 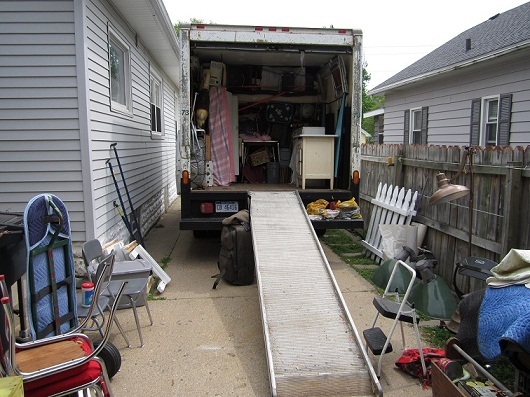 The truck seemed to start fine most of the rest of the time and we were able to pack it up and get outta there. However, on the way up North in Michigan to reset a booth in Elk Rapids we discovered a leak. Turns out it was brake fluid. We spent 4 hours at the truck mechanic shop getting the master brake line redone. I said goodbye to Lisa B probably 4 times as the truck started and stalled on the way out of my driveway. I was much relieved to know she made it back home last night. You never know what can happen on the road. I'd say we were pretty lucky we didn't have bad problems in the middle of nowhere or lose the brakes altogether! 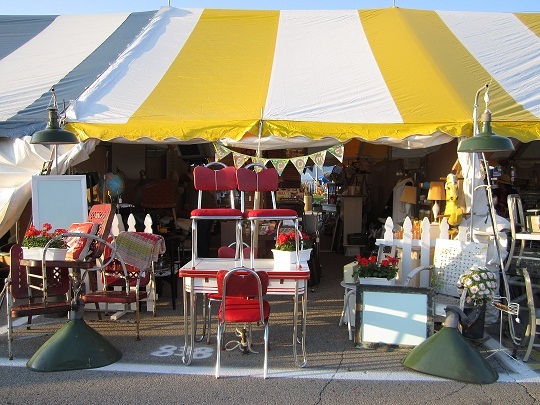 Well, we’re all packed up and ready to roll out tomorrow for The Vintage Marketplace this weekend in Springfield, OH within the Springfield Antique Show! Just a couple things to get together like directions and snacks! 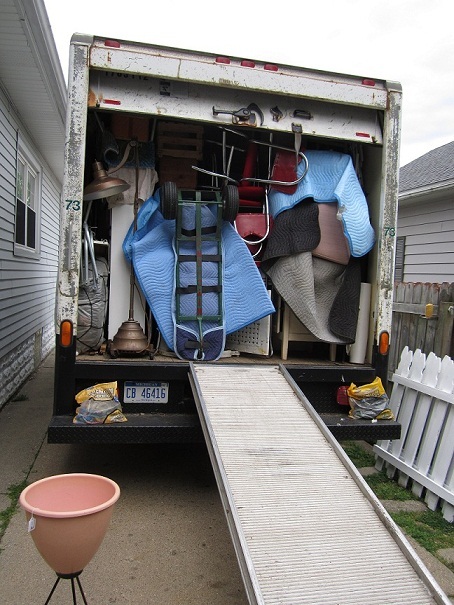 Even we can hardly believe how much stuff we fit in this truck!!! Loadin up the truck, long way to go in this pic! The garage behind me still looks totally full. Voila! DONE! You can barely close the door but we got it all in minus a chair! I give us 5 stars for being the packing geniuses that we are. Here are a few newly available artgoodies designs! My classic red bike is available for a limited time in this great turquoisey aqua blue! 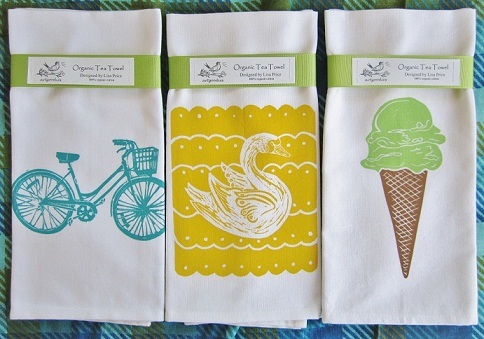 Plus my swan towel is back this summer in 100% certified organic cotton AND artgoodies first and only 2 color ice cream tea towel is back by popular demand! It’s inspired by my summertime favorite, Boonie Doon’s mint green ice cream! All 3 are available here now! It’s almost here! 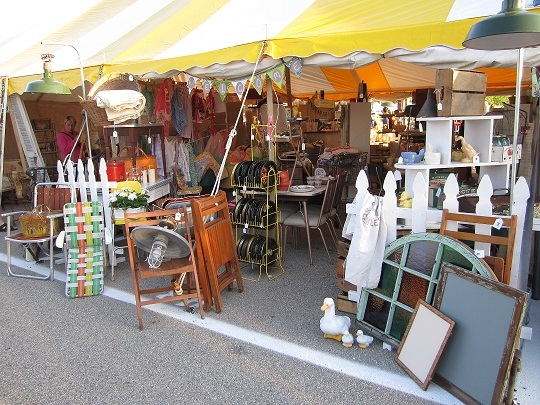 The Vintage Marketplace inside the Springfield Antique show is comin up quick! This May 18-20th in Springfield, OH. Myself and Lisa B will have a fantastic booth filled to the brim with vintage wonders and vintage inspired handmade goods! Below are the beginnings of what’s headed to the show. 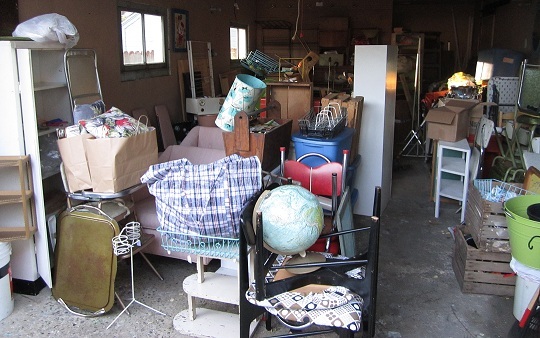 This unorganized mess is a little embarrassing but I can’t wait to merchandise it all into a beautiful vintage shop! I sure hope we can fit all this in the truck!!! This is just my half, aahhahaa! 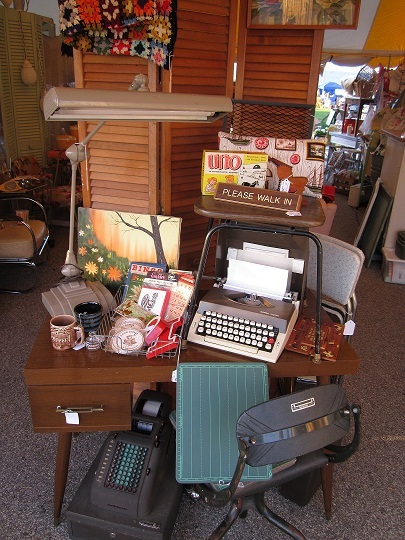 Lots of great larger pieces and tons of smaller vintage goodies for you! Shop the early bird time on Friday and get first dibs on all the treasures! Stay tuned for more pics as we load up the truck and migrate to Ohio! Color of the month comin at ya early this month! I love all this aqua blue business! My collection seems to be expanding beyond the little corner shelves in my kitchen nook. As usual, some items in my vignette and table setting are for sale here and the others will squeeze back into my little shelves. So many favorite pieces this month! 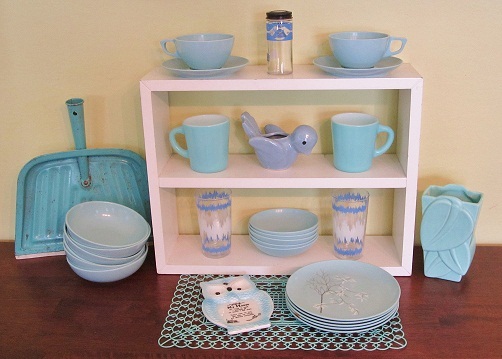 The blue melmac is fantastic, the aqua plastic doily placemat, the glassware, the fired on aqua milk glass mugs, the newly acquired aqua dust pan, the aqua owl with home saying, the birdie planter, and finally the leaf vase. Do you know if the leaf vase is McCoy? I can't find it in my books, but it seems like an earlier one perhaps. This melmac with tree design is amazing. I just love how it goes with the vintage tablecloth! 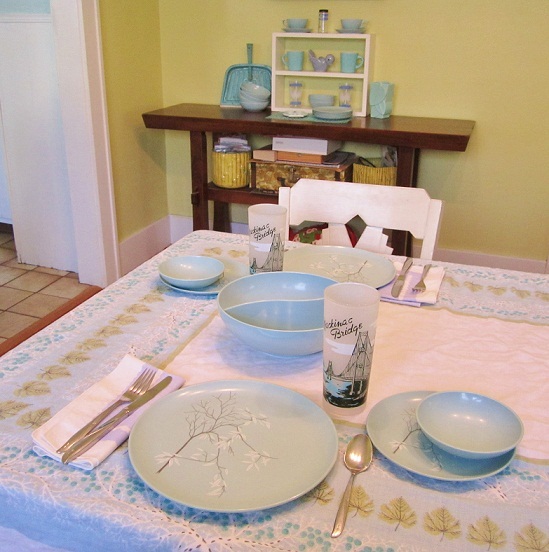 More vintage napkins, and some Mackinac Bridge glasses make this a lovely table setting indeed!